With property values soaring across Los Angeles, homeowners are spending more and more money on massive remodeling projects like never before. These expensive home improvement projects also include the upgrading of their garage door for reasons both practical and more aesthetic. What is the specific reason fueling this boom of garage door and other home improvement projects? Quite simply it is all about home equity, and the huge amount of it that many Los Angeles homeowners now have access to. Unlike certain remodeling projects that could be regarded as mere folly’s, replacing or upgrading a garage door is one of the more sensible, yet highly aesthetic, projects you could take on for your house. Whether you have just moved into a new home or are using equity to remodel, installing a new garage door can help make your residence feel truly like your own. A garage door can help shape your home into whatever style you want and a great example of this is when you order and install a custom garage door. What about the actual door materials? The garage opening system? Do you want paneling or a more seamless look? There is also the question of cost, even with huge equity increases many homeowners want to consider their options purely on a financial basis. A great example of this very personal decision making process can be seen with Overhead Doors Los Angeles most popular custom garage door style at the moment, which is the EL150 Aluminum Glass Door. This custom made garage door is sold on our website as a ‘thoroughly modern and contemporary frameless glass and aluminum’ garage door and is so popular throughout Los Angeles that our technicians have recently built more of these custom doors than any other style on our top 5 list. 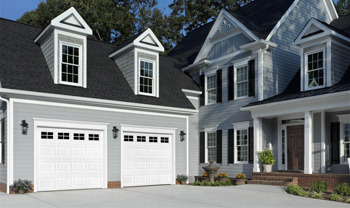 The Carriage House style of garage door adds a particular style to your home, with an aesthetic leaning towards the more classic, farmhouse feel. Although, with the selection available here at Overhead Door Los Angeles, you can also find more contemporary carriage door styles that give off a more industrial and factory feel. One of the more popular carriage house range of garage doors stocked are those from Wayne Dalton, one of the most prestigious garage door makers around. Our Custom Wood garage doors are built to spec by our exceptional craftsmen and can be made from a variety of premium woods such as cedar, meranti, hemlock and poplar. This craftsmanship and choice of premium woods is what gives the custom wood door its popularity, and with options that will suit a range of architectural themes it is no wonder Los Angeles is seeing more and more custom wood style garage doors being fitted. By their very name the short and long panel style of door are based around the shape of the panels on each door installed. These panel styles have incredible value for the money and offer Overhead Door’s legendary performance & durability in the shape of a more traditional style looking garage door. The flush panel garage doors offer a different take on the panel styling with a raised panel look, whereas the groove panel garage door offers a step up from the traditional look with vertical grooves that can also convey a more stately carriage style aesthetic. Every panel style garage door is made with hot-dipped galvanized steel with two coats of baked-on polyester paint which will help keep your panel style door looking and operating to our high standards for years to come. So now you know what styles of garage doors are currently hot around Los Angeles, but how do you pick which door is best for you from such a varied list? Quite simply you don’t. As with all decisions about your home, you shouldn’t pick what works for others but what works for you. Here at Overhead Door Of The LA Basin we stock many more styles of garage doors, some more popular than others but all of them built and installed to our high standards, and we invite you to come and discover your new garage door style by browsing our extensive catalog OR call one of our friendly and knowledgeable team members today and they can help advise.